I hemmed and hawed about writing this post, as yesterday was a meaningful date in my personal history. On the evening of Friday, 19 October 2007, my father died. I would not find out about until the next day – Saturday – as my mother called me almost 8 hours later, leaving a four-word message on the home answering machine, to inform me that my father had passed. My husband, my sons, and I had returned from a local skate tournament to see that little flashing light notifying us of an incoming call that we had received earlier that afternoon from an unfamiliar number. I had been estranged from my parents for several years at that point. To put it bluntly, my mother had ‘disowned’ me in 2005 over something so incredibly petty that I am ashamed to admit now that I honored her wishes for nearly 2 years. And, unfortunately, my father did, too. But I remember that last conversation that I’d had with my father in early October 2005. Cancer had returned – malignant melanoma – but my father had insisted that it wasn’t such a big deal. We danced around the subject of the impending surgery that would require the loss of his right eye, and, in typical form, my father joked about his options upon coming to terms with the reality that he’d probably have to wear an eyepatch. He insisted that he couldn’t decide if he should tell people that he’d become a pirate, or if he should tell people that he’d given his eye to Odin, for knowledge. I didn’t know what to say; I was just pleased to be speaking to my father, and I told him that I would be delighted to support him in either choice. In a roundabout way, I was trying to comfort him, but honestly, I would have agreed to support him in any way that I could, even if most of the time my support of him simply required that I cheerfully go along with his jokes. That was my father. That’s the way that he coped best with adversity – through joking about it. Despite this, I truly thought that my father and I would speak again. After my father died, my brother told me that the cancer had spread rather fast – but my father was overly proud man and it surprised no one that my father insisted on downplaying the debilitating effects on his quality of life – but as a result, my father refused to allow anyone to contact me concerning this reality. I’ve no doubt that my father thought that he’d live forever, as long as he could joke about it, but he told my brother that he was even more ashamed to be seen as sickly or frail by anyone, let alone, his daughters. Please let them remember me the way that I was was what I was told that he had said. It turned out that my older sister -who was also estranged, also ‘disowned’ by my mother – didn’t even know that he’d died until two months after the funeral. While I am grateful that at least I had been informed in time to actually attend his funeral, I’m ashamed to admit that I was told that she knew but that she just didn’t show. I regret that I didn’t question that further. But, my dysfunctional family aside, I miss my father dearly, even now, even today, eight years later. So what do I do to honor my father? I will hold a ‘silent supper’ for him this week, wherein I provide him offerings of his favorite foods. Steak and potatoes. Blueberry pie. Sardines. Figs. 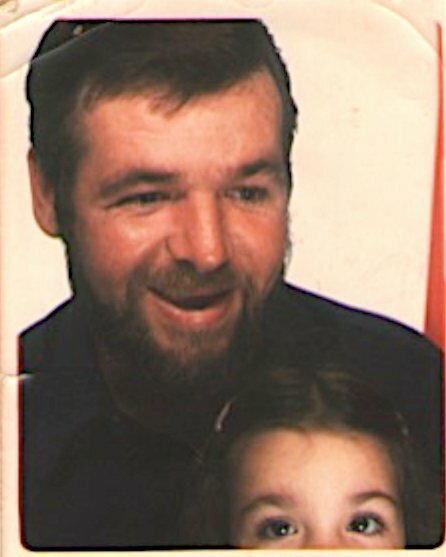 This is a photo-booth photo of my father and I from 1974ish or so. It is one of my favorite photos that I have of my father. 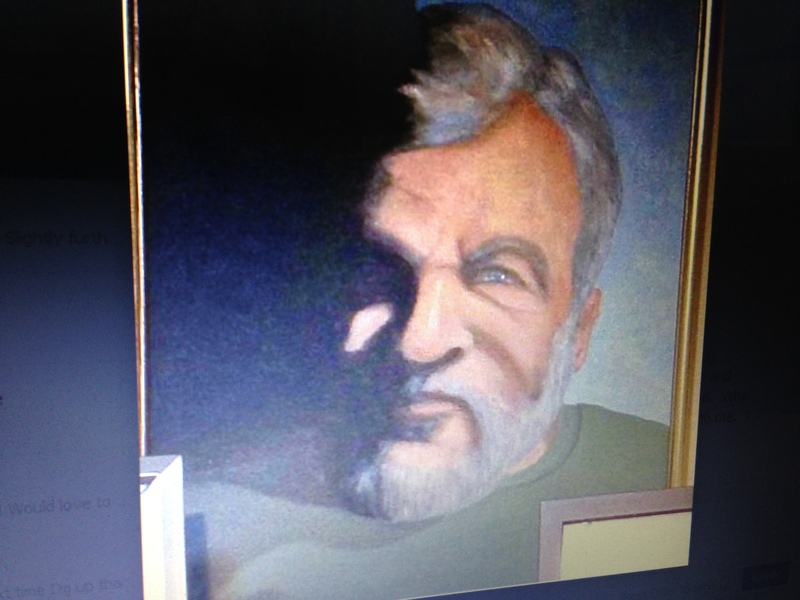 This is a photo of a self-portrait that my father painted in early 2007. Your losses are easy to see, even through the Internet, and even after so much time has passed. Your father sounds like a man who cared deeply for his family – even with his reluctance to get your mother’s hackles up, it sounds like he was trying to look out for someone, even if he chose the wrong person to look out for in that case. If it wouldn’t be too personal, would you mind describing some of your happy memories with him? I ask this because this post describes mostly how he was while contending with cancer, and how he contended with death … how did he contend with life?